Five years ago, “coupon” was a dirty word to many online retailers. While coupons and discounts were viewed as necessary, they held a negative connotation. Today, things are different. Discounts and coupons are consistently used by retailers and are now seen as an effective tool for driving sales. As a shopper, you get a clear, monetary benefit. As a retailer, coupons incentivize shoppers to purchase, create brand loyalty, and allow you to easily diversify your promotional marketing. Why Should I Use Coupons? What does this tell us? First, retailers are buying into coupons as an effective way to provide value to shoppers and drive sales. While you could be a rebel and not use coupon codes on your store, the numbers tell us that you definitely should be. E-commerce promotions capitalize on online consumer behavior which makes it easier for you to sell to shoppers despite how much competition is out there. A common misconception with sales promotions is that you have to offer crazy discounts or incentives to drive sales conversions. While bigger incentives may be more appealing, a small incentive can still make a positive impact on sales and you won’t have to diminish your margins drastically. We are all aware that November and December drive nearly ¼ of all e-commerce revenue but there are other opportunities out there that you can capitalize on. Think Valentine’s Day, Halloween, Mother’s Day and so on. By running promotions around key dates and holidays, you can convert more sales and add value to keep shoppers coming back. It’s also important to consider that you will face less competition promotion wise on these key dates that aren’t during the big holiday season. Take a look at this e-commerce promotional calendar to pinpoint your next big sales opportunity! On average, 98% of new visitors don’t convert into a lead or sale? Almost all of the traffic that you end up driving to your website results in nothing. Yes, some of these new visitors who don’t convert may come back at another time, but you have no way of knowing how much of this traffic will return. This puts heavy emphasis on converting the current website visitors. Promotions provide an effective way to engage and convert traffic. Serving up an offer that says “Welcome! Take 15% off of your first order. Enter your email to get the code” will provide the opportunity to drive sales but also focuses on capturing email leads so you can retarget these visitors for free with email campaigns. For just a moment, think of your e-commerce store as a brick and mortar store. You’d never let someone walk through the front door without engaging them in some manner. Whether it be welcoming them, notifying them of current promotions, or providing them with some information, you have to engage that shopper. The same goes for your e-commerce store and promotions. This is your opportunity to directly engage each shopper with something that could be of value to them. 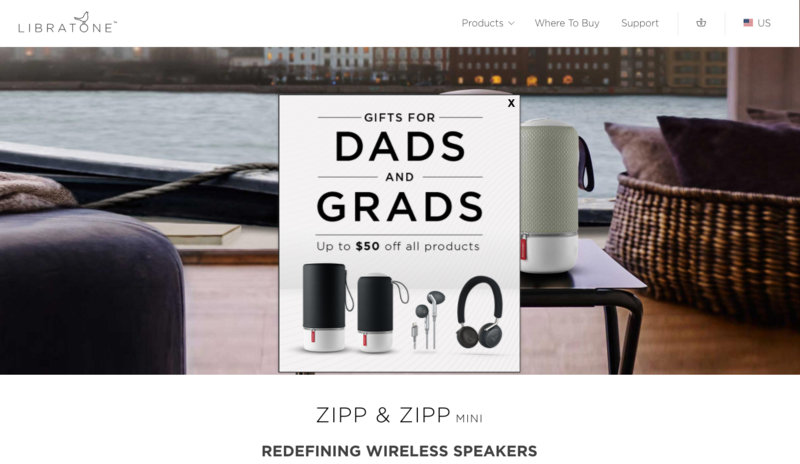 Using a pop-up promotion to provide something of value to your visitors (discount, free shipping, free gift wrapping) this will only enhance their shopping experience. With pop-ups, think key moments during a visitor session. Upon entry, upon exit, and on cart/checkout pages to put that final stamp on the sale! Shipping cost is largely based on size and weight which means that every business will have fluctuations in shipping cost. If free shipping works with your margins and cost structure then look to use it in your e-commerce marketing strategy. If the cost is just too high, there are a couple of ways to make it work for your business. We will touch on these later on in the post. Have some promotional items or some items that just won’t sell? Use these items to close sales conversions. A gift with purchase can be that needed additional value to push shoppers to buy from you! Note: Currently, Shopify doesn’t offer a promo code option that will automatically add a free item to the shopping cart. If you do run a gift with purchase promotion, be sure to let shoppers know that the free item will be included in the order. To track things on your end, create a unique promo code for this offer. It can be difficult for some businesses to offer sales promotions without it digging into profit margins. However, by using thresholds, most brands can offer a discount or free shipping promotion in a way that benefits their business. For businesses who want to run promotions but have low-profit margins, threshold promotions are the way to go. While discount promotions are going to convert at a much higher rate and result in sales, it’s nice to have some other options to use in traffic conversion campaigns. Here are a couple go to non-discount promotions to use when discounts don’t make sense with your marketing strategy. 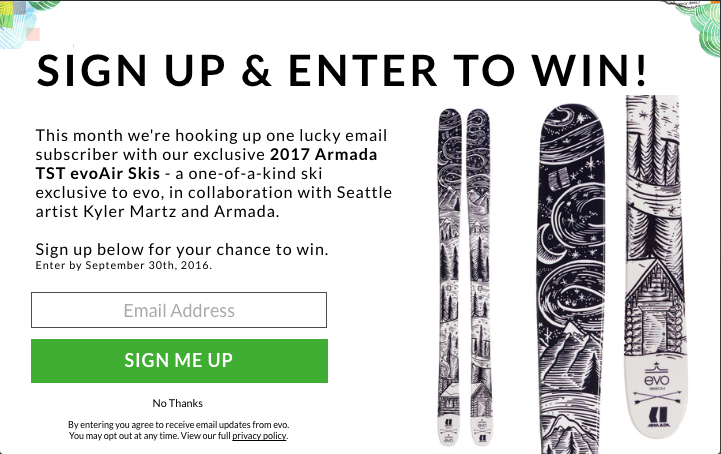 Contests are an incredibly effective way to drive engagement and email sign-ups. Running a contest is simple! 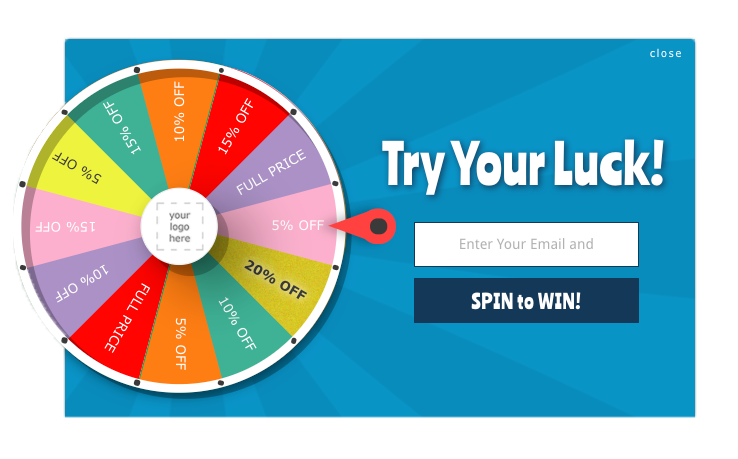 Offer your visitors a chance to win a big ticket item (or bundle) by entering their email address. This can be one of your products or something else, but it must be something that your ideal customer will be interested in. One thing to keep in mind is if you do decide to choose one of your products, this may prevent people from purchasing that visit because they’ll wait to see if they win. If this is the case, send a followup email to all entries who did not win with a promo code to use on your site. Contests are perfect for businesses who want to convert a higher percentage of new traffic arriving on their site. Since a high ticket item is attractive, many new visitors who are interested in your products will enter their email for a chance to win. This is a perfect way to boost lead conversion from Facebook ads and other PPC advertising. Value doesn’t always have to be provided through discounts or high-value items. Content is an excellent way to interact with shoppers and you can use it to your benefit. A gated content promotion allows you to incentivize shoppers to enter their email to gain access to an attractive piece of marketing content. This could be a style guide, recipe book, photo journal, and so on. It’s a great opportunity to get creative and leverage your branding. Here are more ideas and details on gated content. For the most part, you’ll be running sales promotions on your Shopify store through coupon codes. Shopify provides a great framework that allows you to create codes that can only be used in certain situations. Shopify lets you choose how many times a specific coupon code can be used. Select from unlimited, a specific number, or limit one use per customer. Create promo codes that will only be valid during certain date ranges. This enables you to set up holiday and sale promotions with ease. Here’s the full Shopify support documentation on promo codes. The Price Rules API allows retailers to dynamically create discounts with multiple conditions that can be applied at checkout to cart items or shipping lines via a discount code. This update gives retailers much more flexibility with discounts and promotions. At this time, these new price rules are not built into the basic discount codes creator and do require custom coding. 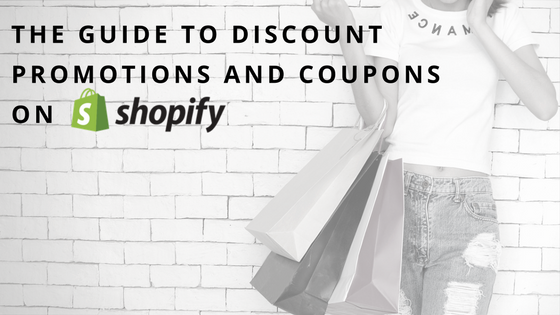 Nevertheless, we’re excited to see where Shopify is going with discount capabilities! When using coupon codes, it’s in your best interest to control the distribution of the codes. Two of the biggest reasons for cart abandonment are price shopping and coupon hunting. If you can offer a coupon on your site, you eliminate both of those problems. There’s also the problem of having to pay affiliate fees to sites like retailmenot when a shopper gets a code from that site. Also, what if that code doesn’t work? Now you have an unhappy shopper. The simplest and most effective way to drive sales with your Shopify coupon codes is through the use of on-site promotions. 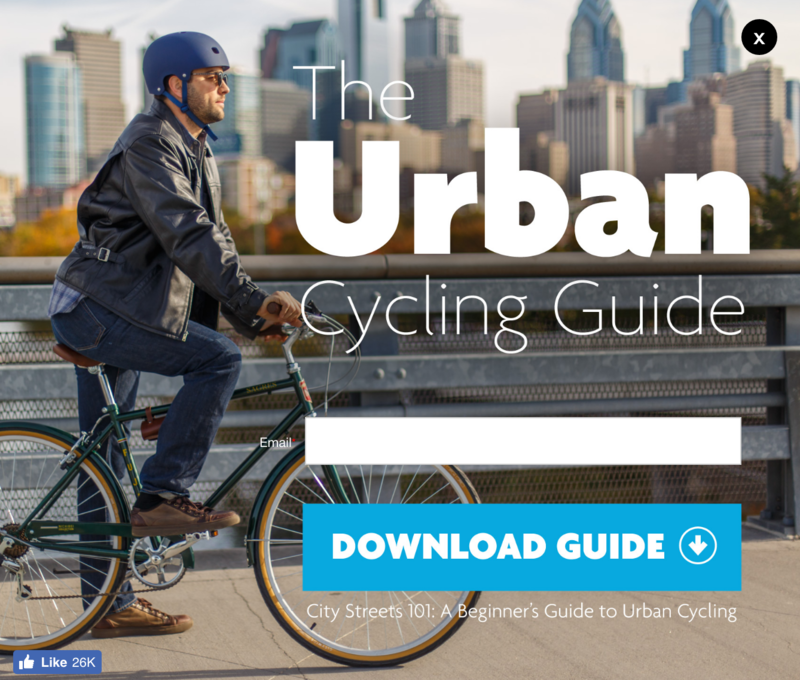 Think email pop-ups, sales banners, and exit pop-ups on the cart page. 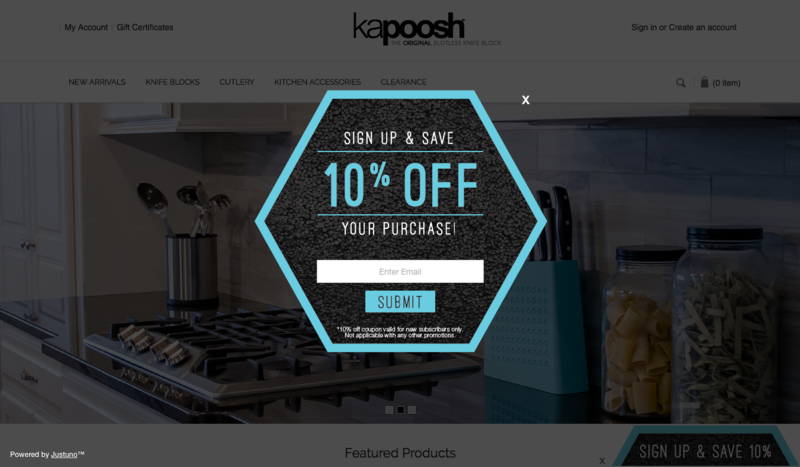 You have control over your discounts and coupons, so use them in your marketing campaigns! Use the Best. Download Justuno for Shopify! 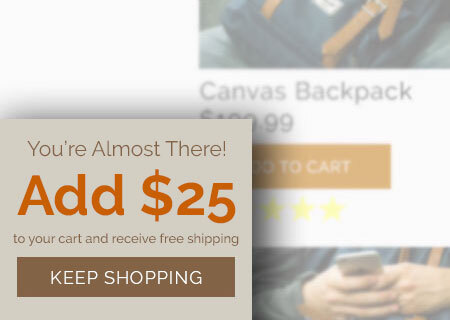 The Justuno app for Shopify provides every conversion marketing app that you’ll ever need to run effective discount promotions. 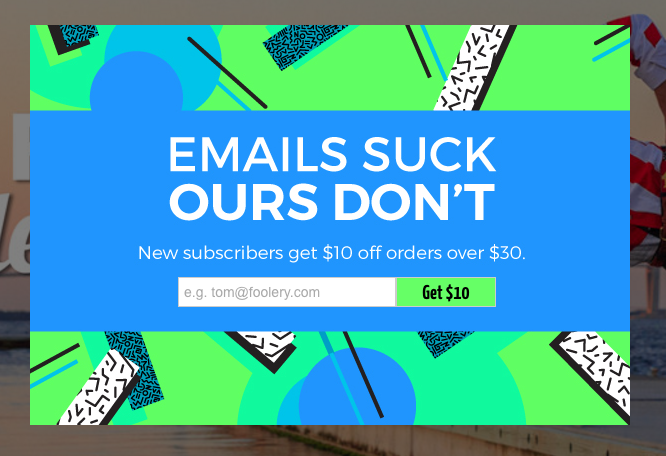 Use email pop-ups, banners, slide-ins, and exit pop-ups to distribute Shopify coupon codes.